Test your balance and try our Stand Up Paddle Boards – on a hot summer day you won’t even worry about falling in! Stand Up Paddle Boarding can be a fun afternoon activity or a strategic tool to get closer to prime spots for snorkeling, fishing & oyster collecting for dinner! 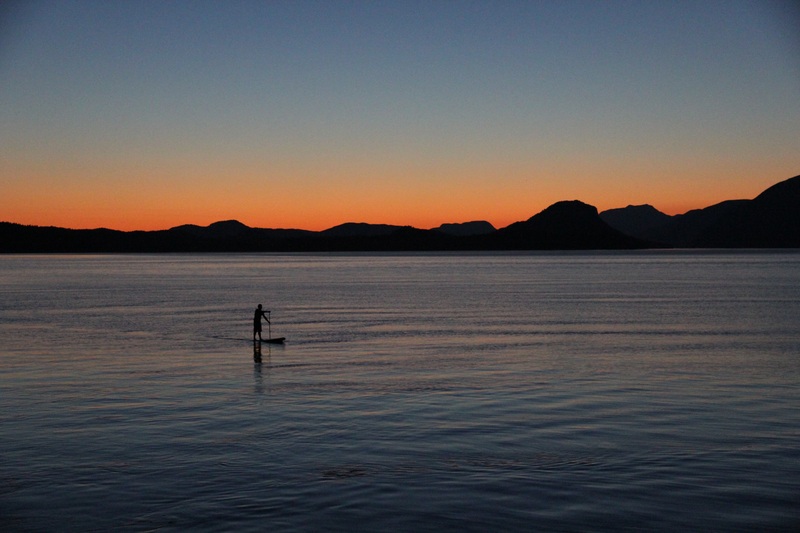 Picture yourself dipping your paddle into the perfectly calm water, gliding effortlessly over colourful sea life, the sun setting over Cortes Island to the west, not another sound to be heard or body to be seen. Long, hot, calm summer days bring perfect paddling conditions. We don’t just mean for kayaks, but stand-up paddle boards as well! Cabana Desolation has paddle boards available for guest use at any time of day. Whether you’re a natural or a complete beginner, paddle boarding is accessible to all. Right off Cabana Point, the two Station Islands are great for exploration by paddle board to get a new perspective of your surroundings. Combine paddle boarding with snorkeling to access especially vibrant marine life. Or, simply use one as an excuse to tumble into the refreshing ocean after a long day of paddling! Another use of paddle boards that has become very popular in the last few years has been to take the boards out on calm, moonless nights and using them to better access and experience the magical phenomenon of bioluminescence. Imagine each dip of your paddle collecting and dispersing thousands and millions of glowing, microscopic organisms, each individual lighting up like fireflies in the black sea below!